I've heard a few comments lately along the lines of, "Only super spiritual/awesome/got-it-all-together/etc parents manage to have a regular family worship time, and the rest of us are just lucky to get to bedtime with everyone still alive." Let me just clarify from the start: we most definitely fall into the "just lucky to get to bedtime with everyone still alive" category! Guys, this parenting thing is HARD. And EXHAUSTING. We are in NO way more spiritual or awesome than any other family, and the got-it-all-together part is just laughable. But we have kind of stumbled into a nightly family worship that we all really enjoy, so I thought I'd share a little bit about it in the hopes of encouraging someone else. 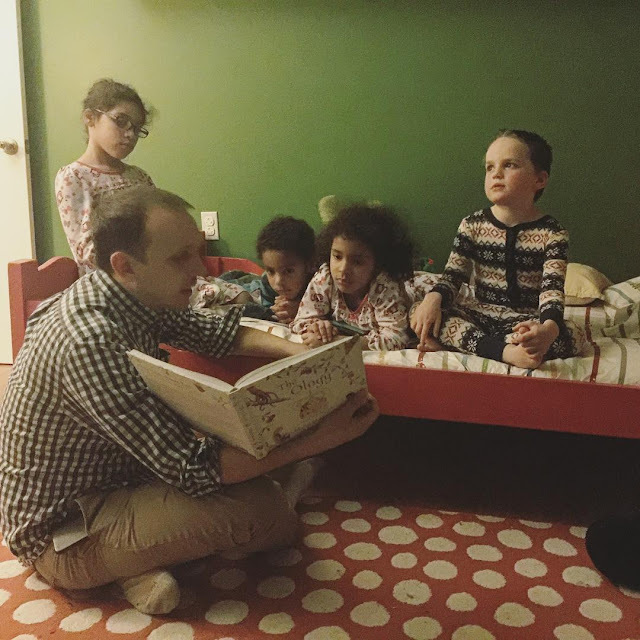 When Jude was about 4, we started having a regular bedtime routine with him that included a bedtime story (see, definitely not the got-it-all-together type if it took us 4 years to even have a regular bedtime routine with our only child). After getting him ready for bed, we all went in his room and read through a picture story Bible beside his bed each night, then prayed for him and kissed him goodnight. That's pretty basic and easy, and I bet many of my friends already do this. 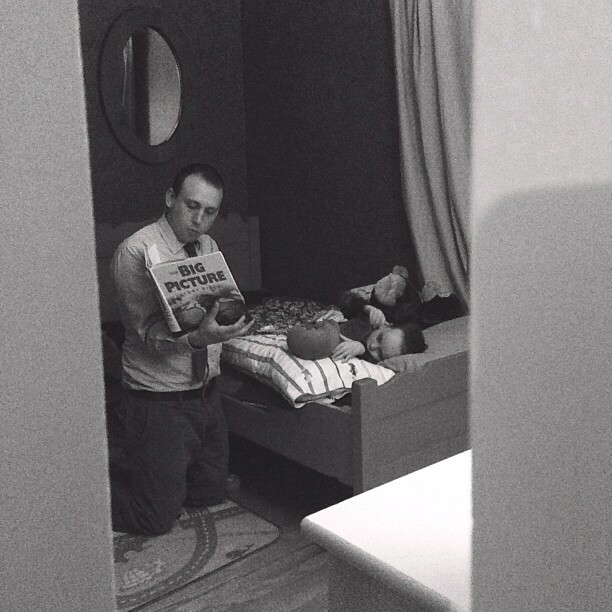 When JJ, Taylah, and Haylee came to us, we folded them right into our bedtime routine. Everyone sat on Jude's bed while one of us read, then everyone kissed each other and headed to bed, where Josh and I split up and one prayed for the girls and one prayed for the boys individually in their beds. (Or on nights when only one of us is home to do bedtime, we do one room and then the other.) And of course lately we've added a sweet little ball of love to the mix, who is usually happy to sit in my lap during this time. If you're doing something along these lines with your kids already, I wouldn't beat yourself up about not having some other kind of family worship. This IS family worship! We kept this routine up for almost 2 years, the only real change being which story Bible we read (more on that in a bit), until a couple of months ago when Keith and Kristyn Getty came out with a new album, Facing a Task Unfinished. Josh was excited to learn the songs and teach them to the rest of us, so we started singing one or two after the story. But it was hard to do in the bedroom, so we moved to the living room where we can cast the lyrics to the TV as we sing along. At the same time, some prayer needs for various missionary friends overseas came up, so after we read the Bible story and sang, we naturally moved over to our huge school map that hangs in the living room and pointed to our friends' countries as we prayed for them. And that is the story of how our family naturally stumbled into having something that really feels like family worship every evening. This will look different for each family, but I want to encourage you that it IS possible for normal people to do. If you take nothing else away from this post, remember that family worship is vitally important to do in some way, but looks different for every family, and doesn't have to be long or complicated. And after reading through all of those (some 2 or 3 times), we are currently enjoying Long Story Short, which is more of a devotional format with readings from the Bible along with a lesson and questions. Long Story Short covers the Old Testament, and when we finish it we plan on going through Old Story New, which is written by the same person and covers the New Testament. I'd love to hear what your family does for bedtime and/or family worship, and if you'd recommend any other story Bibles that we haven't yet discovered!